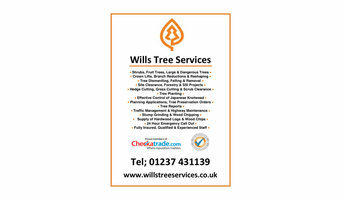 Wills Tree Services are a professional tree surgery company working throughout Devon, Cornwall & Somerset, we believe our prices for the fully insured service we offer cannot be beaten without compromising safety or the quality of the workmanship. Our experienced & qualified staff are able to undertake all aspects of tree surgery, we have a clear understanding of the arboricultural needs of local authorities, businesses, construction industry, schools as well as private individuals & we work quickly & efficiently with minimal disruption to you, your clients or the surroundings, ensuring we leave properties & work sites as clean as possible, all of our clients benefit from our professional and efficient service. We are happy to visit at a time that suits you, advise & provide a detailed written quotation without charge or obligation, so please do not hesitate to call or e mail us to arrange an appointment. We are an advanced tree care company that aim to achieve results that are desirable for our clients and beneficial for their trees. We use modern, up to date equipment and fully qualified and insured aborists. Barcham Trees PLC has a 350 acre tree nursery in Ely, Cambridge, UK where we grow 400 varieties of semi mature instant impact trees. 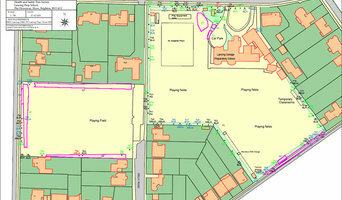 Trees grown in accordance with our Bio Security Policy, to ensure healthy trees are supplied into the UK Landscape. The trees are harvested from our fields into container pots. After 6 months or so, the root system is mature and the trees are ready for sale. Garden trees, screening trees, avenue trees, hedging trees, trees for coastal planting, parklands, municipal spaces. 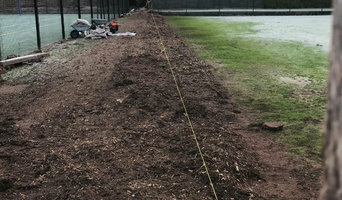 Established by Carl Stedman following more than 13 years experience in the arboricultural industry, tree-tek is a local, independent family run business specialising in high quality tree surgery services, tree stump removal and log supplies. We have a passion for the industry we work in and pride ourselves in our professional approach, providing honest advice and a service delivered at a competitive cost. Tonks Brothers Tree Services is a family run business established in 1995 by James Tonks and his father John, based near Lichfield, Staffordshire. They were joined by his brother Jonathan in 1997 and together they have worked hard to earn a reputation for their high standard and competitively priced professional tree surgery. As the business grew over the years, James wife Clare joined the team to manage the office and administration. Offering tree services in South London, Pace Arboriculture was established in 2003 combining over 16 years of experience serving domestic and commercial clients. Demian Pace has extensive knowledge and a commitment to providing a considered approach to customers needs. Knowledge gained through canopy research and arboricultural education gives us a unique attitude to the urban treescape. We are fully insured and our services are carried out to the highest standards. All waste is responsibly disposed of, we are highly environmentally aware company and continue to strive to improve our practices and lessen our impact on the environment. We operate in all the Greater London boroughs. Artemis Tree Services are the tree work industry leaders throughout Rickmansworth, Watford and the wider London area. Established in 1998, Artemis delivers a service based on quality, professionalism and value for money to all domestic and commercial clients. As an approved tree surgery contractor for local authorities, their expert arborists have years of experience in treating and maintaining trees. 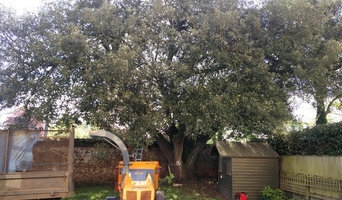 Oaklands Tree Surgeon Specialists, one of its kinds are the reliable professional offering wide range of Tree Surgery, Tree Cutting, Landscaping, Hedge Trimming, Hedge Pruning, Stump Grinding, Waste Removal, Waste Disposal, Site Clearance and Registered Waste Carriers services in St Albans, Harpenden and Hertfordshire. With more than 14 years of experience in horticulture sector, Oaklands Tree Surgeon becomes the local tree specialist service provider meeting the immediate and regular demands of gardeners, homeowners or commercial establishments on regular or contractual basis. We offer a full range of Tree Surgery & Landscaping Services throughout the South West. Our friendly and knowledgeable Tree Surgeons and Landscapers are fully qualified, insured and very experienced. Whether you require simple tree surgery & tree pruning or complete tree felling and tree stump removal we take pride in our professional approach & always leave the site tidy & clear. Our Landscapers love nothing more than working with our customers to create beautiful, bespoke gardens. We can help you realise the potential in your outdoor spaces to give you the garden you have always dreamed of. We are active supporters of The Badgers Trust, The Bat Conservation Trust, RSPB and The Butterfly Conservation Trust. Getting a Christmas tree quickly delivered to your door has never been easier as it's now with our reliable services in London. Forget about the hassle of choosing or collecting the Christmas tree you've always wanted - we can do it all for you at more than affordable price. We offer fast delivery, professional installation, collection and recycling of premium Nordmann Fir trees that will surely brighten up your place and your Christmas mood, moreover, will fit your budget. Give us a call now and get a real Christmas tree you have always dreamed of - we operate 24 hours a day, 7 days a week. Basic tree surgery involves pruning trees that have overgrown; cutting down branches that are dangerous or growing too high, far or wide; or shaping the whole tree. 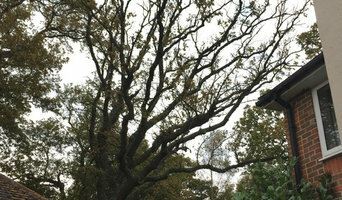 However, many tree surgeons can carry out a number of other tree services, including tree planting, felling whole trees, trimming hedges or large plants, tree stump removal and even installing tree lights. Arborists will be more technically trained and can diagnose tree diseases as well as advising on how best to prune and maintain your trees. Unfortunately, trees don’t grow overnight but instead need a bit of lasting care and attention. To make sure they get the best start, ask a tree surgeon if they will carry out tree planting for you and give you advice on how to look after your new saplings. Arborists should definitely be able to do this, and most tree surgeons will too, but not necessarily so it’s always best to check before on the exact tree services they offer. Arborists will also be able to advise you on where to plant your trees and whether you have the suitable ground soil for them. Whatever your tree care problem, you can find tree surgeons and more tree services on Houzz to help you. If you’re planning on landscaping your garden as well as adding some trees, then you should talk to gardening professionals at the same time as tree surgery specialists. Here are some related professionals and vendors to complement the work of tree services: Landscape Contractors, Landscape Architects & Garden Designers, Garden & Landscape Supplies. Find tree service professionals on Houzz. Look in the Professionals section under tree services. You can look through arborists’ and tree surgeons’ portfolios and read reviews to see what past clients have to say.